Of course the majority of the bones in the hand we pretty straight forward. 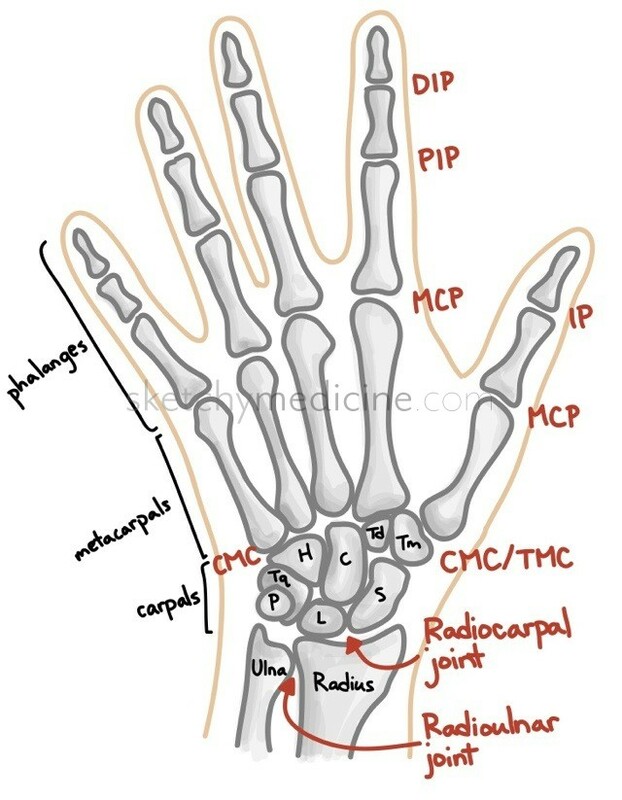 You have your metacarpals, appropriately named first through fifth and the same goes with the phalanges. The important thing to remember is that the thumb is phalanges-challenged and only has two instead of three. The reason this can mess people up is that in the thumb only has one interphalangeal (IP) joint whereas the fingers have a proximal interphalangeal (PIP) joint and a distal interphalangeal (DIP) joint. It’s usually the CMC joint of the thumb (AKA the TMC joint because it’s an articulation between the trapezium and 1st metacarpal) that gives women grief in later life as its prone to arthritis. The radioulnar joint is one of the articulation points for supination and pronation and the radiocarpal joint is the articulation for extension and flexion. This entry was posted in Anatomy, Emergency, Ortho, Plastics and tagged hands, MSK by Ali. Bookmark the permalink.